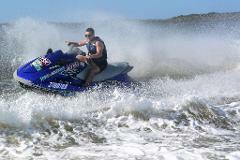 Glasshouse Twister (90min, $280 per jet ski) Our most popular! 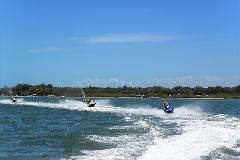 Combine the thrills and spills of the Bribie Blast with an eco-adventure that will leave you spellbound. The gentle 10 km alternative – a laid back, relaxed chance to see the northern end of Pumicestone Passage on a clean green fun machine. Fancy a ride on a jetski but don't want to do the driving yourself? Jump on the back with Ken and explore Pumicestone Passage. 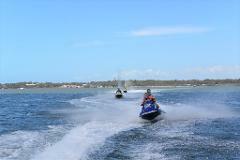 Come for a Spin - take one of our trips for half price.- $60 for City Explorer, $80 for Bribie Blast - by riding on the guide's jetski. Not for the faint-hearted! This half-day tour starts at Spinnaker Sound Marina and circumnavigates Bribie Island, using the Pumicestone Passage up to Caloundra, and returns down the Skirmish Passage, with a halfway refreshments stop. This 90 minute roller coaster has everything! Feel the thrill of riding the waves in the open ocean, the exhilaration of weaving between islands, the adrenalin of the Figure Eights and hot laps. A swashbuckling 60 minute rollick in Pumicestone Passage. The Curated Plate Festival proudly presents the Caloundra Jetski Seafood Safari... the most exciting way to get to a seafood extravaganza.